It looks like another leak season is upon us and this time it’s related to the Intel 300 series launch. 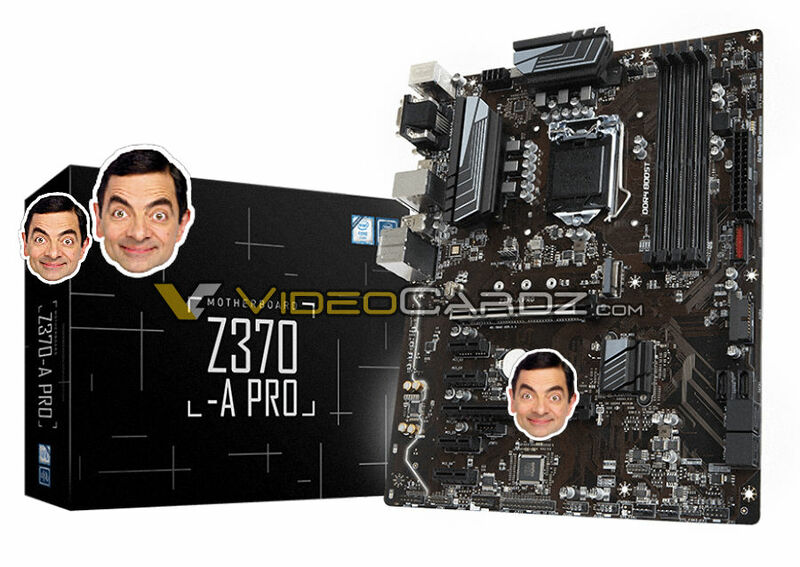 The latest of leaks come straight from Videocardz who have managed to capture two Z370 boards which are manufactured by Intel’s board partner, MSI. First of all, we are certain that Intel will be launching their Coffee Lake desktop processors in the first week of October. This is also confirmed by Videocardz who have slated the launch to take place on 5th October (Rumored). We have a more detailed article coming on the Intel Coffee Lake CPUs in a bit, but before that, let’s take a look at the 300 series ecosystem itself. For starters, there will only the Z370 and H370 chipset motherboards with the entry level B360 chipset launching a bit later around 2018. Coming to the motherboards themselves, first up we have the MSI Z370 Godlike Gaming. This Z370 chipset based motherboard screams high-end judging from its design and features. It has the new LGA 1151v2 socket which is just LGA 1151 repurposed for Coffee Lake chips as additional electrical lanes had to be enabled. The motherboard has a solid 18 phase VRM design that is powered by a 2 x 8 pin connector configuration. The phases are cooled by large heatsinks that come with a heat pipe cooling solution. Just next to the CPU socket are four DDR4 DIMM slots that feature stainless steel brackets for extra durability. In terms of expansion, this motherboard comes with a load of options. There are four, full length PCIe 3.0 x16 slots, all of which feature metal shielding. 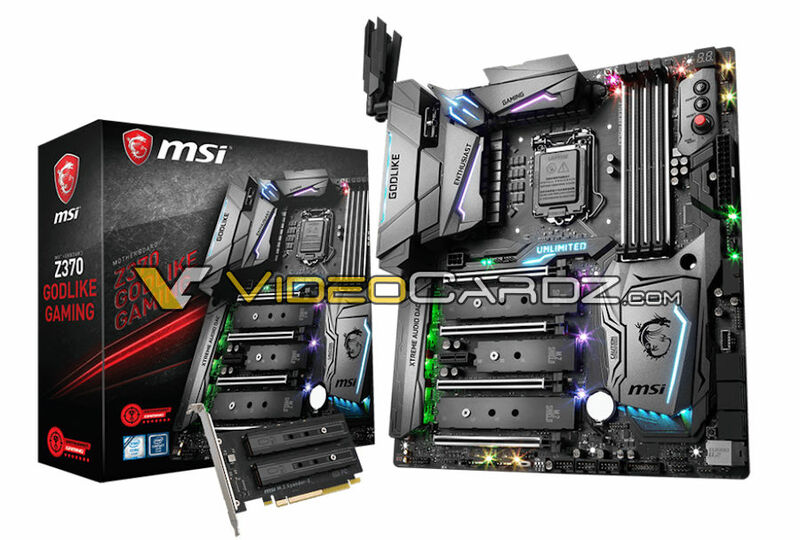 There is a single PCIe 3.0 x1 slot but for M.2 expansion, MSI has added triple M.2 slots, two of which are full length and all of them come with the M.2 shield that offers better cooling for M.2 devices. The unique thing about this board is that MSI has even bundled an M.2 riser card, so if you want more M.2 storage devices on the board, you can add up to 2 with the PCIe riser card and that too comes with M.2 shield heatsinks. Now, I am not entirely sure what’s the use of so many M.2 ports as mainstream platforms usually lack the high number of PCIe lanes as the HEDT parts, but it could be possible that MSI has external PCIe controllers underneath the massive PCH heatsink that will allow for high-end storage capabilities of this board to be used to their fullest potential. There’s also a 6 pin auxiallary connector that will help deliver more power to keep the expansion slots fed. Moving on, we can spot 6 SATA III ports, a U.2 port and a USB 3.1 Type-A internal connector. There are also two USB 3.0 front panel headers, three USB 2.0 front panel headers and a variety of tuning and overclocking switches and knobs to the top right corner of the board. The design scheme of the board is very aggressive and there’s a very colorful display of RGB all around. The Xtreme Audio DAC unit can also be spotted and is lit by a green light. You will have the options to change LED color modes or switch them off entirely as per your requirements. Finally, the I/O shield, while not detailed, is fully protected by an I/O cover and will ship with two large antennas that will allow for wireless functionality. Expect this motherboard to cost around the $400 US or even higher price range. Next up, we have the MSI Z370-A Pro which is the more budget optimized offering. Compared to the Z270-A Pro Gaming, we are looking at a better tuned VRM area that comes with 6 phase power delivery and a single 8 pin connector to supply power to the CPU socket. There are some bulky heatsinks on the PWM unit, however the PCH is cooled by a tiny heatsink. There are four DDR4 DIMM slots which will be able to support up to 64 GB memory capacity. Expansion slots include two PCIe 3.0 x16, four PCIe 3.0 x1 and a single M.2 slot. Storage includes 6 SATA III ports, two USB 3.0 front panel headers and two USB 2.0 front panel headers. The board is very simple in terms of design and has a brown colored PCB. The motherboard should cost less than $120 US at launch.